Does not use any harsh bleaching agents. Only 2 mins of brushing required. Typically see results after just 1 or 2 treatments. Looks and feels strange as it is black and grainy. Risk of causing damage to enamel if used excessively. The use of activated charcoal to whiten teeth has really taken off recently. This has caused many brands to create and distribute their own formulation of activated charcoal. However very few products can boast the success of Active Wow. 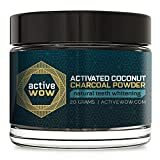 Active Wow have a variety of products in their range of Activated Charcoal Teeth Whitening products. These include Peppermint, Spearmint and Vanilla. However their Natural version continues to be the most popular and successful. Utilising the highest quality coconut sources a natural formula of activated charcoal is specifically created for teeth whitening. Gain a beautiful white smile in the comfort of your own home quickly, safely and painlessly. There is no longer any need for an expensive dentist procedure which can take hours out of your day. Leveraging the super absorbent power of activated charcoal, this teeth whitener removes stains caused by coffee, staining food, wine, cigarettes and so on. The best part about using this product is the fact that there are no harsh chemicals or bleaching agents. The Active Wow Activated Charcoal Natural Teeth Whitening product typically has users seeing noticeable results in as little as the first or second application. And the best thing is each treatment only lasts a couple of minutes! In the teeth whitening industry this is pretty unheard of. Other types of products or procedures normally require a longer treatment time. Fast results combined with a relatively low cost has obviously contributed to tremendous sales and very impressive feedback on Amazon. With over 12,885 reviews they are sitting pretty at 4.5 / 5 stars which proves their results. On their product page you can see a very clear before and after photo showing a great result. But here is the real kicker. As you scroll through their customer reviews on Amazon you can see actual customer’s before and after photos showing their own dramatic results. A collage of a few has been created below. Overall we highly recommend this product for teeth whitening. However, no product is perfect. And even though this is a natural teeth whitening product, you still need to take care with it’s use to ensure you don’t over use it. After all charcoal is an abrasive substance and if you brush too hard on your teeth or for too long you can damage your teeth enamel. To prevent this, all you need to do is ensure you follow the manufacturers instructions. Happy whitening! MADE IN THE USA - And 3rd party tested for safety. Active Wow can be used daily. Be careful with other brands that can't say the same. WHITEN YOUR TEETH - No sensitivity, premium organic charcoal, excellent for gum health. © teethwhiteningtools.com 2017. All rights reserved.